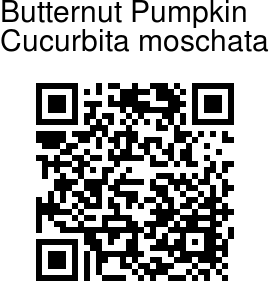 Butternut Pumpkin is native to Central America and northern South America where it was first domesticated. It is a monoecious, creeping, vine-like annual that trails along the ground or climbs by tendrils. It produces a variety of fruits which vary considerably in size and shape due to large genetic variation within this species. 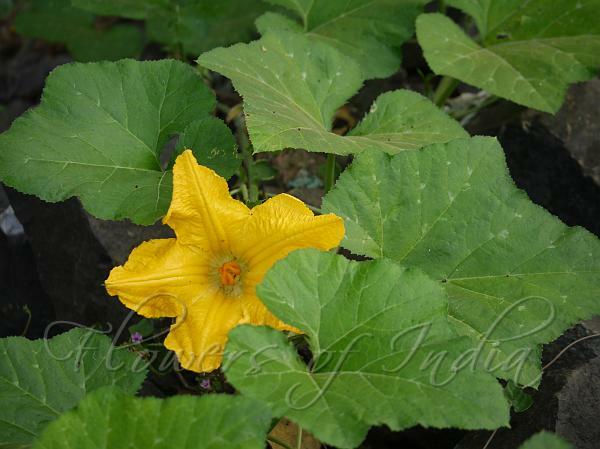 Young leaves, flowers, shoot tips, fruits and seeds are edible. However, the fruits are usually not harvested when young, but are left on the plant to mature for eventual fall harvest as winter squashes. Velvety-hairy, shallowly- to deeply-lobed, broad-ovate to kidney-shaped leaves with toothed margins and cordate bases often have white spots on the veins. Flowers are borne singly in leaf axils. Male flowers are typically long-stalked with three stamens, and female ones typically short-stalked with 3 two-lobed stigmas. Flowers are creamy white to orange-yellow and bloom in late spring. Stalks tend to thicken at the points were the fruits appear. Fruits generally have distinctive orange flesh. Developed commercial cultivars in this species generally fall into three different groups: (1) Neck Group, (2) Cheese Pumpkin Group , and (3) Tropical Group. Identification credit: Gurcharan Singh Photographed at Vaghbil, Maharashtra.